Our first destination in the Bungles was at the southern end of the range at Piccaninny Creek. 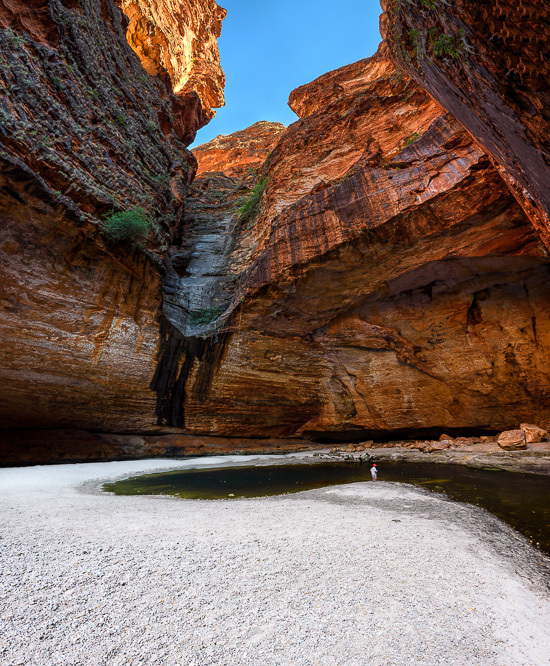 From the car park we’d hike into the most famous of all the Bungle Bungle walks – Cathedral Gorge. It was only a 4km round trip to Cathedral Gorge but it was a very hot day so it was hard work for the two of us :). 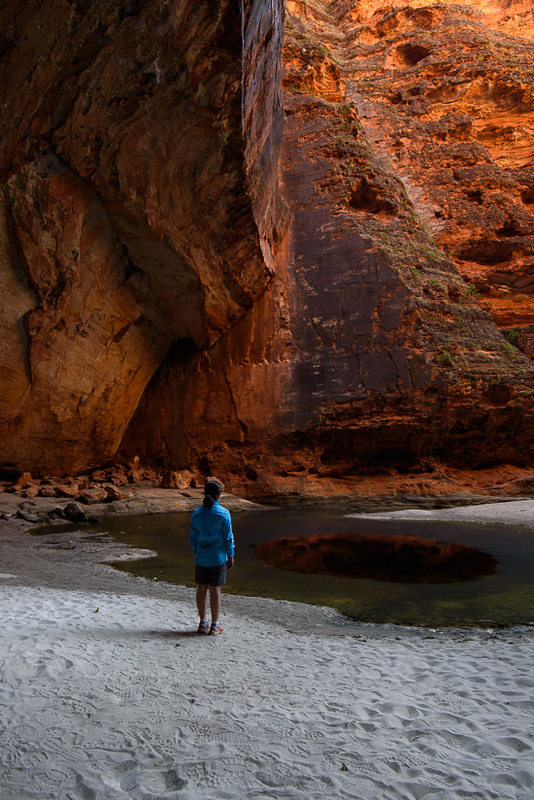 From Piccaninny car park, the walk winds its way through the iconic bee hives, heading down between two walls of rock before opening up into Cathedral Gorge. Water pounding through here in the wet season has created a huge amphitheatre of red rock with a pool of water in the middle. This vertical panorama was a bit of an experiment for me. I’m normally a seascape shooter where I can make use of graduated neutral density filters to deal with vast exposure differences between the landscape and the sky. This works perfectly well when the horizon is relatively flat. Here however I’m inside an open gorge with the overhanging edges putting those areas in deep shadow whilst the opening up to the sky is nuclear bright. Shooting at 10:30AM with the sun high in the sky also adds to the drama :). So I knew I’d have to bracket some frames and use blending or HDR techniques to deal with the exposure differences across the frame. 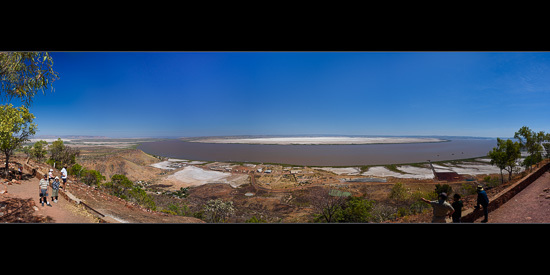 The final panorama is the result of stitching together three roughly 50% overlapped horizontal frames moving from bottom to top. For the bottom image I took three bracketed frames at 0, -1 and +1EV. In the end I simply used the +1EV frame adjusted to stitch in the panorama. For the middle image I also three bracketed frames at 0, -1 and +1EV. Similarly this time I just used the 0EV frame adjusted to stitch in the panorama. Lastly for the top frame which included the hole to the sky I took nine (9) bracketed frames exposed around an exposure compensation of -3EV. The end result, frames at 1EV intervals from -7 to +1EV. I used the -7 to 0EV frames to create an HDR merge. I had to process this as naturally as I could so that it would match and blend with the two straight single exposure RAW images above. 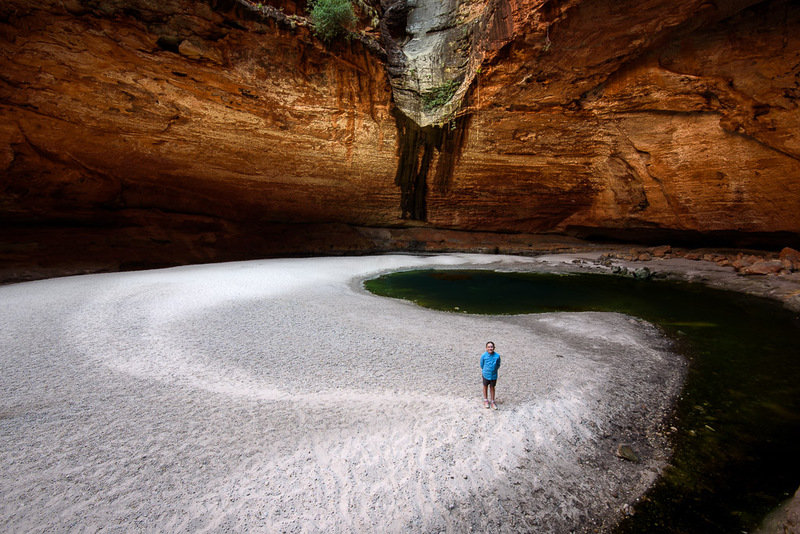 The final result – this surprisingly not horrendously bad vertorama at the amazing Cathedral Gorge. Time for a selfie with my daughter in this special place. 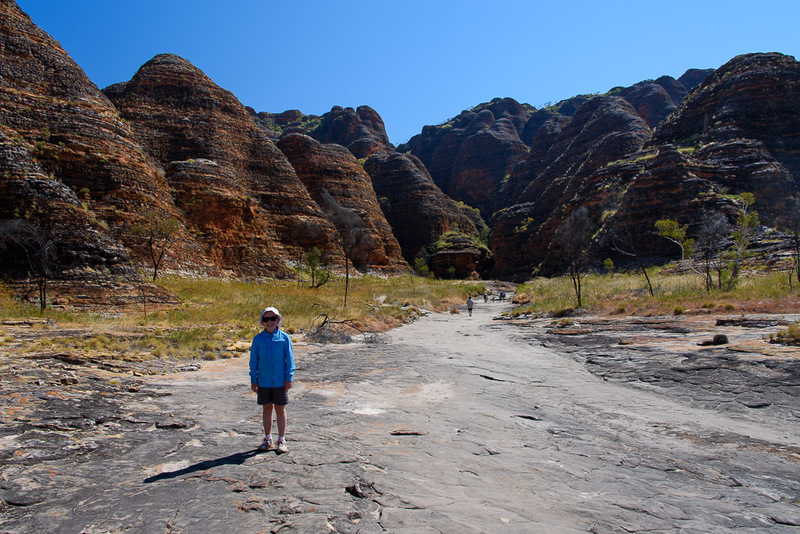 An early morning wake up for my daughter and I this morning – we were heading out on a day tour to the amazing Bungle Bungle range. Where the name Bungle Bungle comes from is not clear. 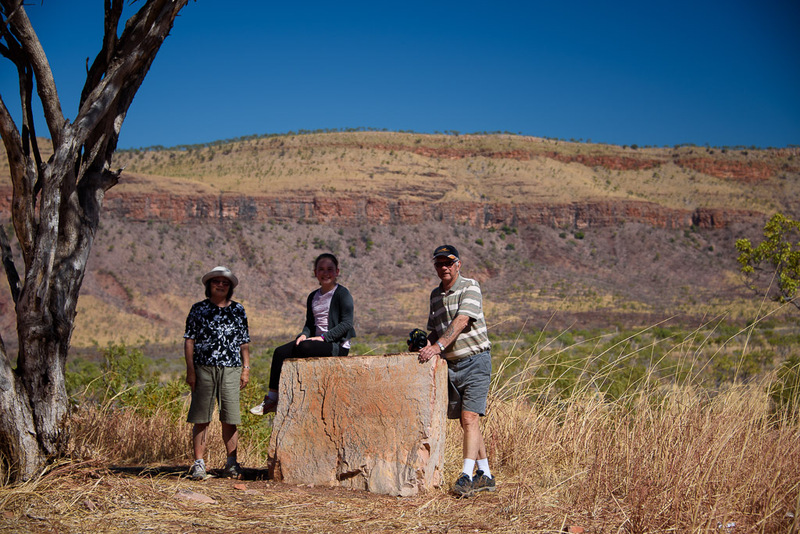 The Kija Aboriginal people, who have lived here for over 20,000 years, called the area Purnululu, the Kija word for sandstone. 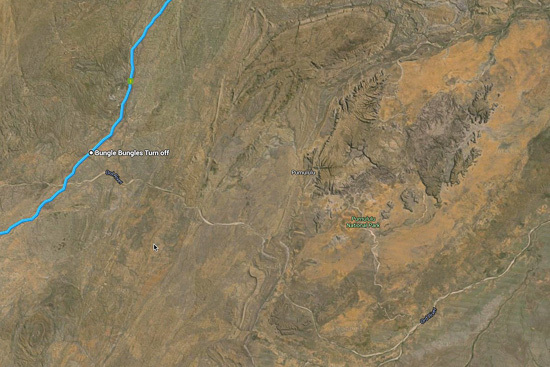 The name Bungle Bungle was first given to a nearby station in 1930. And in 1983, when the Department of Lands And Surveys had to call the range something, they named it after the station. 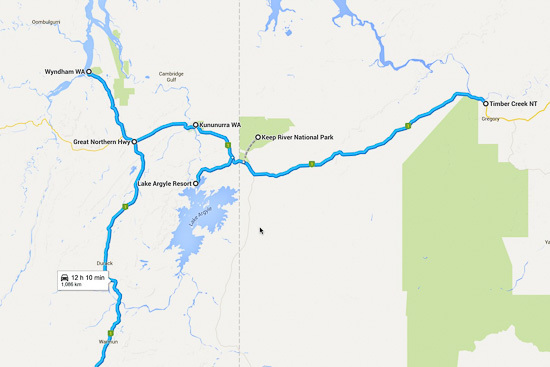 The range, only 100km from the main highway, was only “discovered” by a film team in 1983. 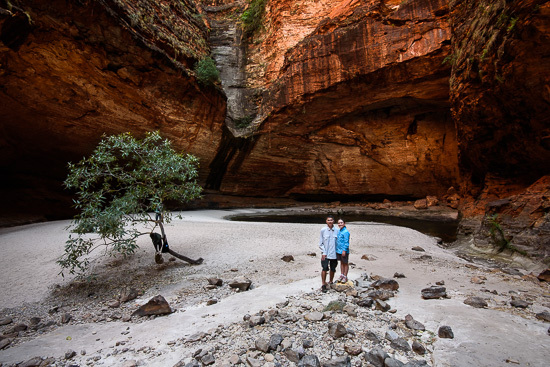 The WA government recognised the botanical importance of the area and also its significance to the traditional inhabitants. Purnululu National Park was established in 1987. It skyrocketed to world fame in no time at all. In 2003 Purnululu NP was inscribed as a World Heritage Area, thanks to its outstanding geological value and its incredible natural beauty. 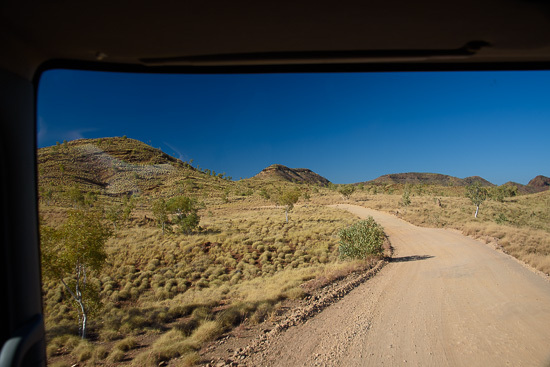 Our 4WD bus left at 7AM, the large bus was very comfortable but the road was epically bad. After 25mins my daughter was feeling quite ill from the rough ride so we moved into the front cabin next to the driver. This ended up being a bit of a blessing in disguise as the view from up high through the massive front panoramic windscreen was excellent. The 53km into the park is via a rugged track that is accessible only to four-wheel-drive vehicles. Even though it is only 53km it is so bad it takes nearly three hours to drive in to the visitors centre. 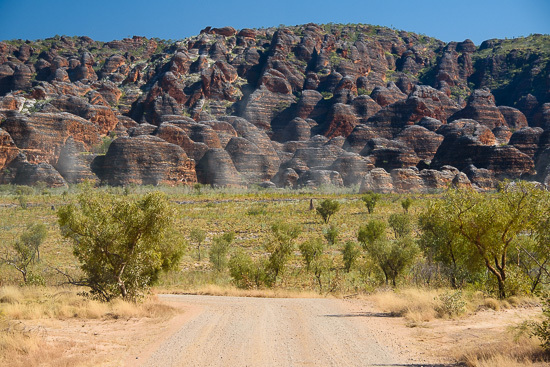 The southern part of Purnululu National Park is the area with the orange and black striped beehive domes that the Bungle Bungle range is so famous for. We had originally thought of staying in Wyndham for the evening but it was still early so we left Wyndham and headed south. 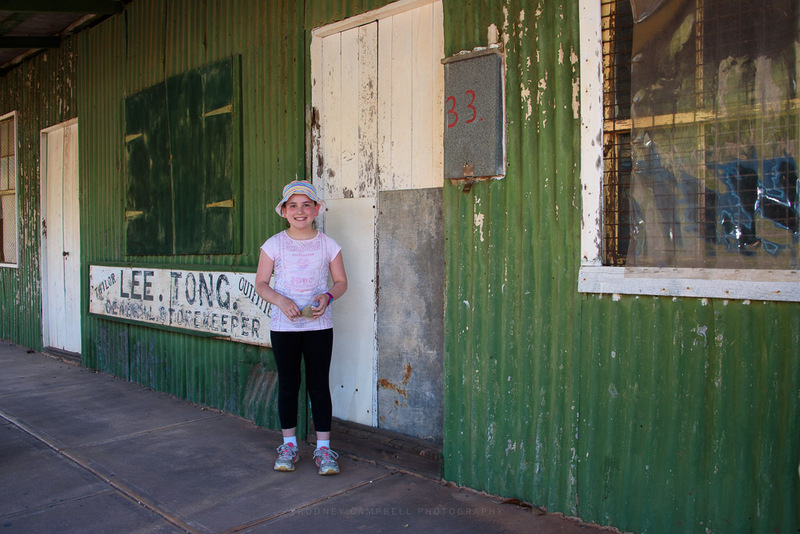 Eventually we arrived at the crossroads between the Great Northern Highway and the Victoria Highway. 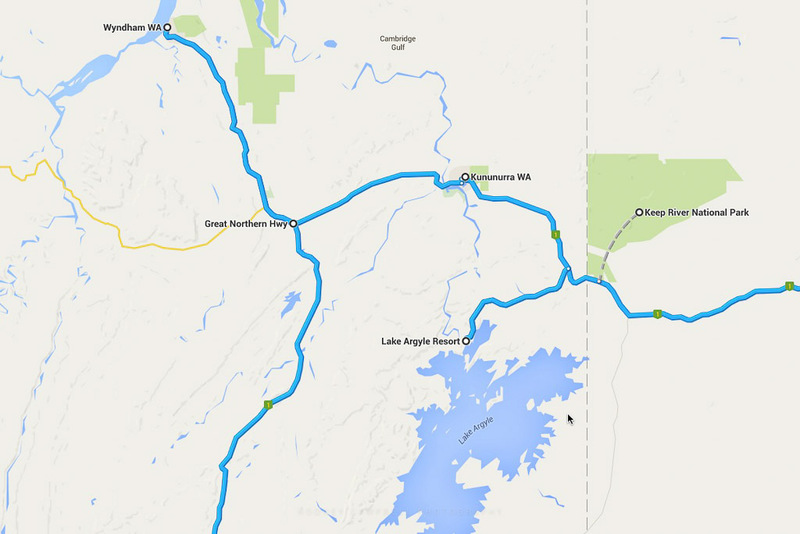 There isn’t a lot here – it’s an intersection of two major highways after all :). However there were a number of other caravans and campers setup here in the rest area for the night so we figured we’d join them. 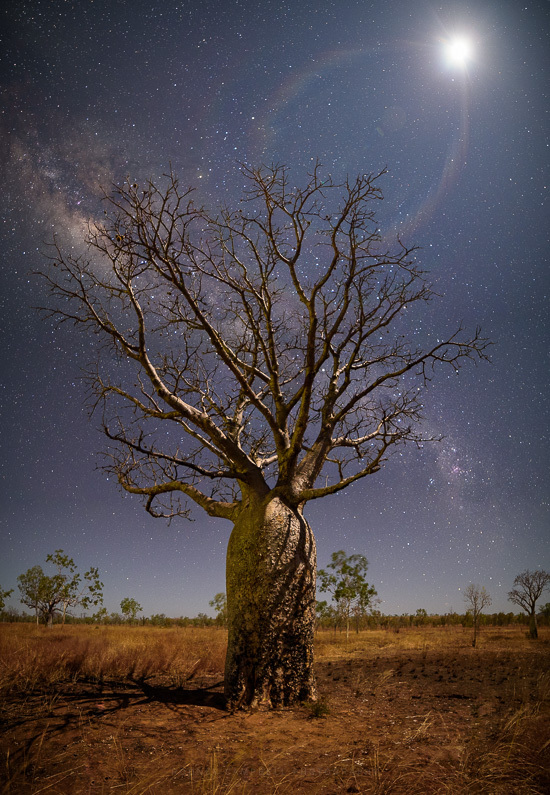 There were a few nice looking Boab trees in a semi clear area nearby so I went for a wander with my daughter just on sunset for a bit of a recce. Surprisingly even though we were literally in the middle of nowhere we had good mobile reception here. 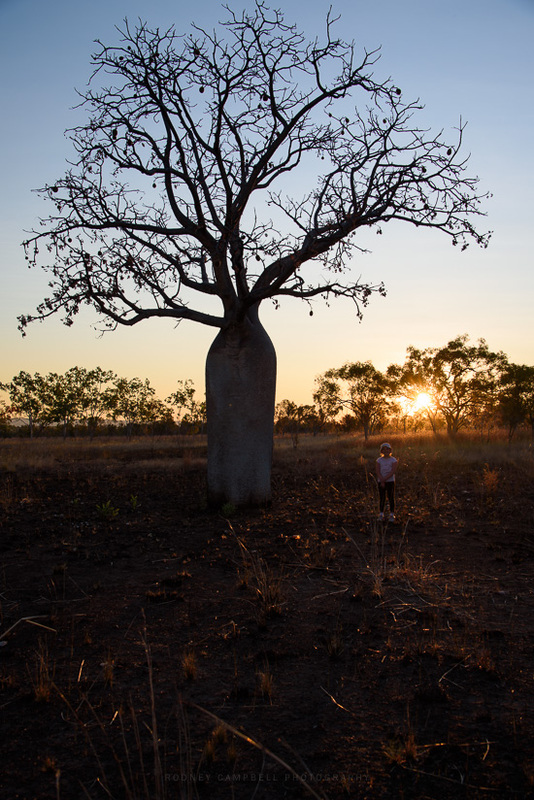 So as the sun set over the Kimberley’s we facetime’d the family so they could enjoy the sunset behind the boab trees with us :). After dinner I went back to the boabs to see if I could make use of the clear skies and the stars again. The moon was well and truly out by this stage. Quite high in the sky and more than a quarter moon. Very much not ideal for shooting the milky way. 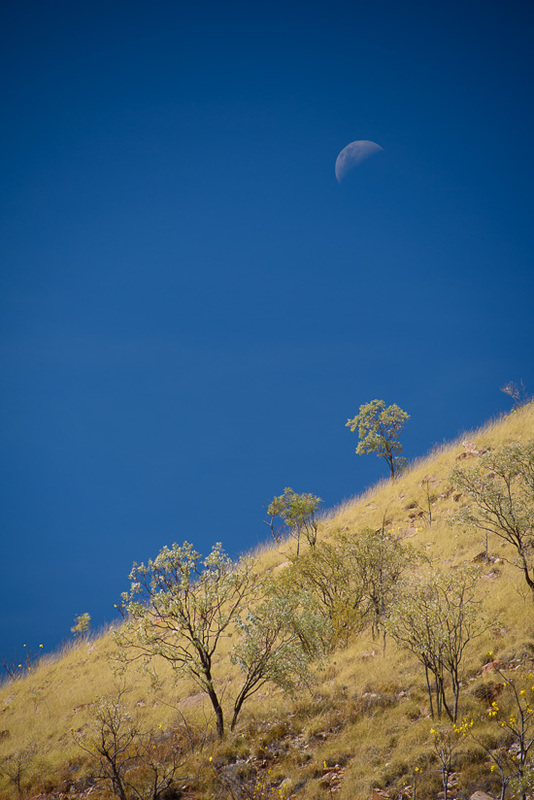 The moonlight did however light the landscape turning night into day so I had to work with it as best I could. I figured the best way to deal with it was to simply include it in the frame. For the image up top and the one below I’ve moved up quite close to the boab to let it fill a lot of the frame. 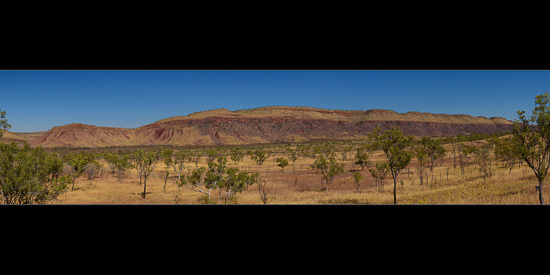 I then took three horizontal overlapping frames moving from top to bottom to create a vertical panorama. 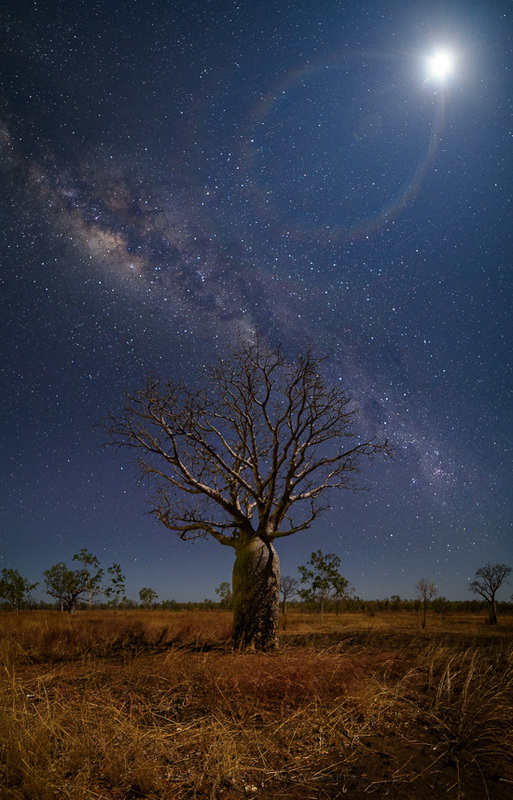 I also tried a horizontal panorama with a milky way arch over this boab using vertical frames with the Samyang 14mm. I really wasn’t hopeful at the time with bright frames on the left from the campsites and the big moon and the massive flare it creates on the right. It’s got issues but I’m hopeful it will also be a potential for inclusion at an exhibition I’ll be doing with the Parallaxis group next year. Finally back at the crossroads and the campsites I saw this couple with their fire out under the stars. They were singing songs accompanied by their guitar. I figured it was worth me trying a shot since I already had the camera on the tripod out. Couldn’t be bothered with a lens change so I just got up reasonably close with the 14mm and had to expose three frames. One for the stars (30 seconds), one for the general moonlit ambient (10 seconds) and one for the couple and their fire (1.5 seconds). I blended the three on layers in Photoshop using luminosity masks and some manual blending for this final result. 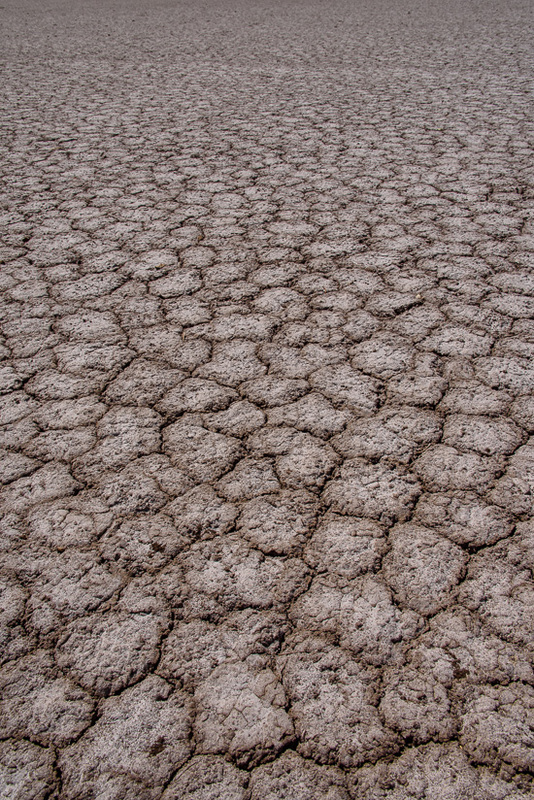 We explored the old town of Wyndham and this gave me the chance to head out onto some of the mud flats and see it up close. Wyndham is the Kimberley’s oldest town, Western Australia’s northernmost town, and it’s also Australia’s hottest town. 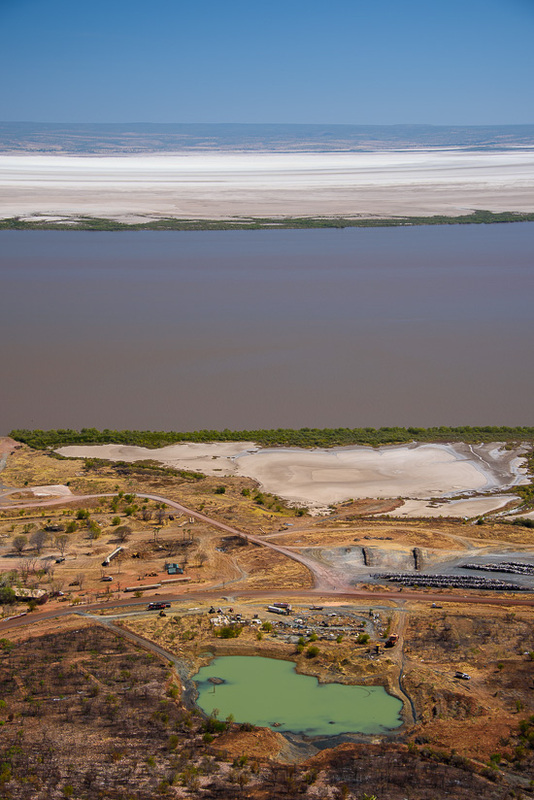 Wyndham’s bizarre and varied landscape has sweeping tidal mud flats covered with mangroves and washed by some of Australia’s highest tides. There is something surreal about the town. Surrounded by the ocean and these massive tidal mud flats you’d be forgiven thinking this almost desolate place was at the edge of the world. The town of Wyndham was established by John Forrest in 1886 as the major port and trading station of the East Kimberley, after finds of gold in Halls Creek a year earlier. By mid-1886, the town was booming. 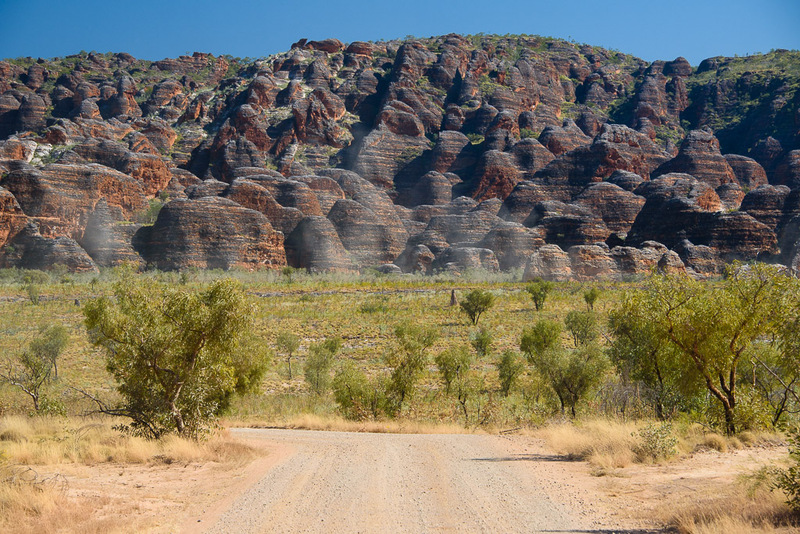 However, by 1888, the gold rush at Halls Creek had ended and the fortunes of Wyndham declined. 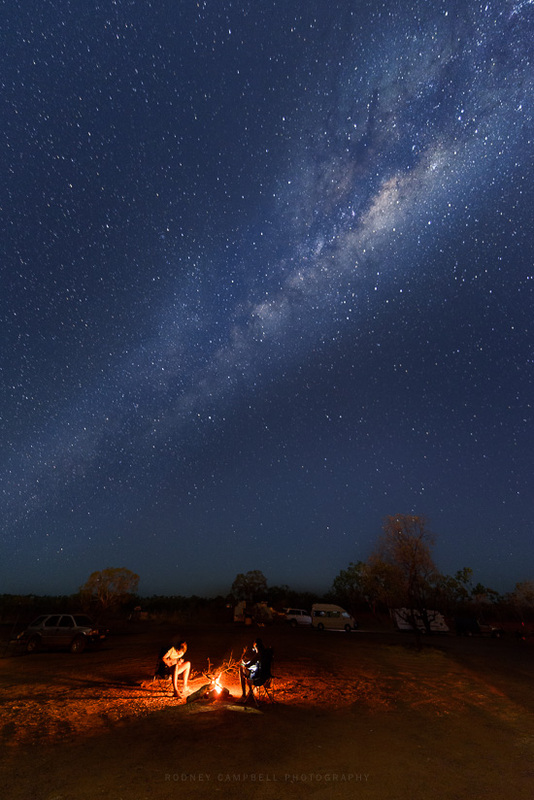 Even though this is only 100km from Kununurra the difference between the two areas is astounding. 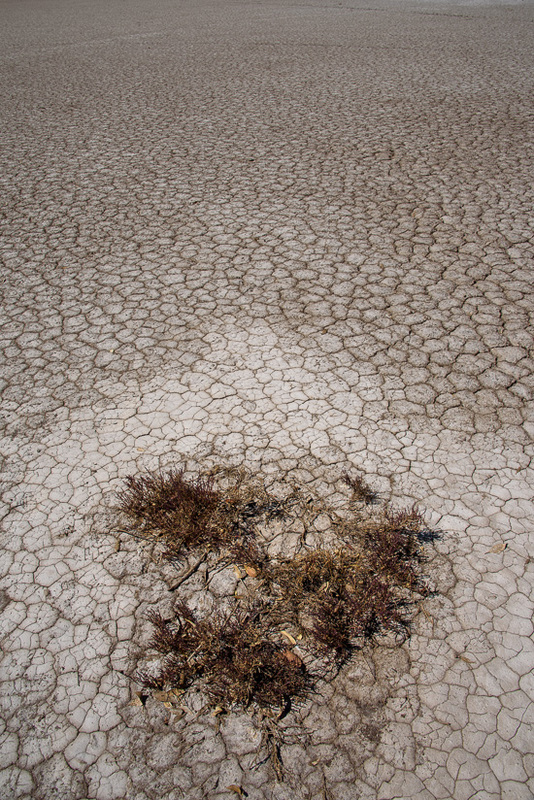 I could easily have spent hours, perhaps even days out here on the mud flats exploring compositions and capturing it in good light. As it was I was here right on midday and unfortunately only had five or ten minutes to make some images. 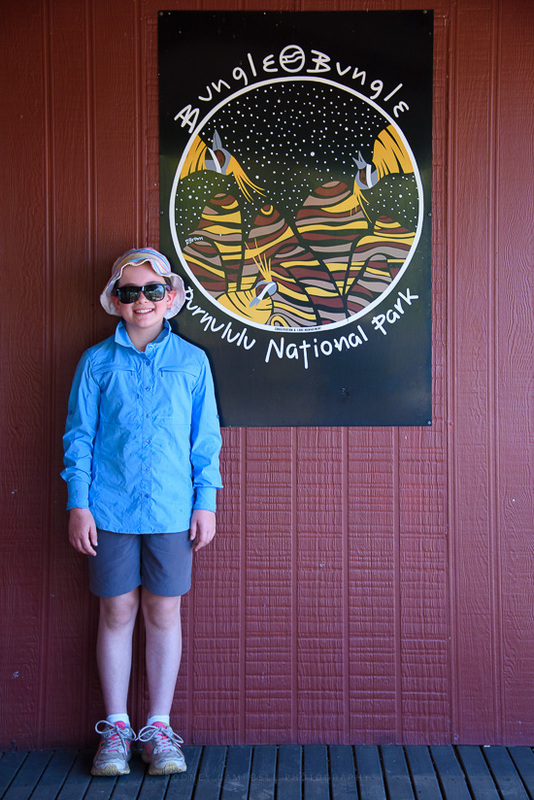 Today we left Kununurra and headed to the coast to visit Wyndham. On the way we stopped at a nice little lookout to view the Cockburn ranges. 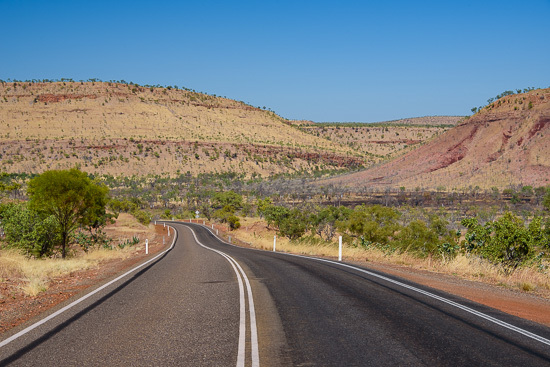 Wyndham is the oldest and northernmost town in the Kimberley region of Western Australia, located over 2,000 kilometres north east of Perth. 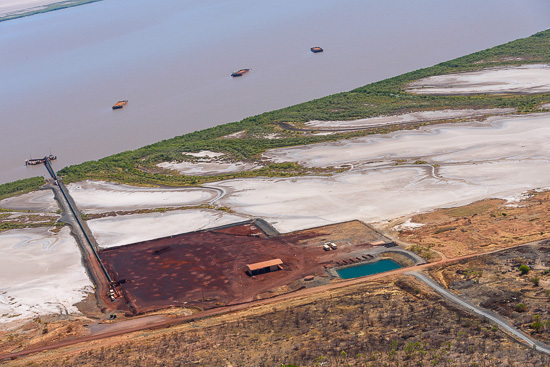 It was established in 1886 as a result of a gold rush at Halls Creek, and it is now a port and service centre for the east Kimberley. The town is split into two areas, the original town site of Wyndham Port is situated on Cambridge Gulf, while the main residential and shopping area of the town is on higher ground around to the left and away from the gulf. Once in Wyndham we unhooked the caravans so we could head up to the five rivers lookout which looks over both Wyndham and Old Wyndham. This vantage is so named because from here you can see where the Ord, Forrest, King, Durack and Pentecost rivers enter the Cambridge gulf. The view from up top is pretty spectacular and you get a real sense for the way the tidal flats work in this region.